Thanksgiving has a variety of traditions, like turkey and football, and what better turkey to represent the day than the Virginia Tech mascot? The maroon and orange turkey may not be as ferocious as a lion or tiger, but he does have spectacular spirit as he struts his stuff around Lane Stadium. 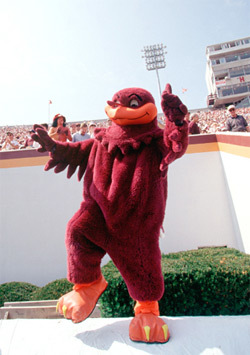 In the 4th quarter as he dances the “Hokie Pokie”, you must admit there’s really no other mascot quite like him! After watching two of the most incompetent NFL coaches bumble along this season, we are grateful that the Cowboys and the Vikings had the courage to fire their head coaches. Minnesota’s Brad Childress lost control of the team early in the season. But his handling of Randy Moss truly epitomized his incompetence. 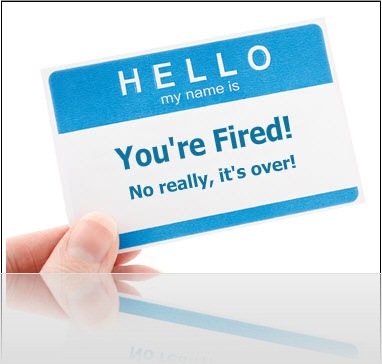 Now at 3-7, it will be interesting to see if interim head coach Leslie Frazier can salvage the season. The Cowboys also made the bold move of firing head coach Wade Phillips mid way through the season. Newly appointed Head Coach Jason Garrett seems to have shaken things up, as the Cowboys are playing much more motivated, disciplined football compared to when Phillips was coach. It remains to be seen if these coaching changes will result in any real improvement in team play. But, at the very least, we are thankful that we no longer have to endure the awkward and embarrassing behaviors of Childress and Phillips. 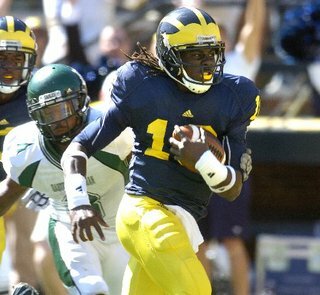 He may not be as popular as Heisman hopeful Cam Newton of Auburn, but there’s something about Denard Robinson that makes us smile! The University of Michigan QB, known as “’Shoelace”, is just plain fun to watch. As he leads the Wolverines with his untied shoelaces and signature dreadlocks, he poses a dual threat to opposing defenses. He alone has accounted for nearly 70% of Michigan’s total offense. He is the first quarterback in NCAA history to pass for more than 1500 yards AND rush for 1500 yards in a single season. At 7-4, Michigan’s season has been disappointing, which is one of the reasons Robinson may not be as highly touted as other Heisman candidates. But nothing beats his pure athleticism and raw talent. He is truly one of the most dynamic players in college football today and one of our very favorite things about this football season! Is there a better story in football this year? After 21 months in federal prison because of his involvement in dog fighting, most people wrote Michael Vick off. He lost his QB position with the Atlanta Falcons, declared bankruptcy and became one of the most despised figures in America. Upon release from prison, most people expected him to return to his old lifestyle and friends and fade into obscurity. But with the help of former Colts coach Tony Dungy, who mentored him while in prison, Vick changed his attitude, his work ethic, and in the end, his life. His story is one of redemption and should give each of us hope. 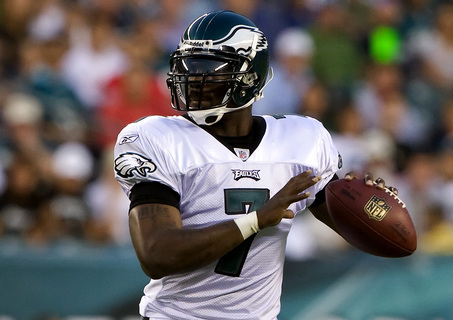 As the starting QB for the Philadelphia Eagles, Vick’s performance this season has been phenomenal. He is a serious contender for this year’s MVP. Under the watchful, fatherly eye of Eagles Head Coach Andy Reid, Vick appears to be thriving both on and off the field. With his unparalleled physical abilities, he is arguably the best overall athlete in the NFL. Like our #2 favorite, Denard Robinson, we just love watching Vick play! That immeasurable, distinctive ability to make plays with both his arm and his legs are simply magical and make him our VERY FAVORITE thing about the 2010 season so far! Happy Thanksgiving fellow football fans! Enjoy the rest of the season! There’s lots of great college gridiron today! Nothing beats the college stadium atmosphere and the fierce loyalty that students, alumni and fans hold for their teams. That passion is unparalleled in all of sports. The tailgates, cheers and mascots help make up the “threads” of the multi-colored college football tapestry. So as we get ready to drown ourselves in our Saturday addiction, we thought it would be fun to look at some of the best college football traditions in a few of today’s match ups. Auburn has one of the coolest traditions in all of college football. Though their mascot is the Tiger, a live eagle soars above the 90,000 cheering fans as the stadium blares out its official fight song “War Eagle”. Click below to see this great Auburn tradition! The Georgia Bulldogs do not have an eagle circling their stadium, but they do have a real, live bulldog named Uga (pronounced UH-ga). Donning a spiked collar and red jersey, Uga paces the sideline expressing the deep loyalty that only a dog can possess. Just last month, the latest Uga (#8) was introduced to the crowd after the previous canine passed away last year. The university reveres their bulldogs so much that deceased Ugas are actually interred in an on campus mausoleum, near the stadium. 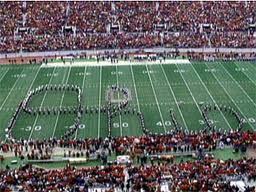 The Ohio State Buckeyes marching band forms the word “Ohio” in script letters at their home games. The letter “i” is then “dotted” by a famous alum, a dignitary, or most often, a sousaphone player. Another Buckeye tradition occurs on the Thursday night prior to their matchup with arch-rival Michigan. Thousands of students gather on campus at Mirror Lake and jump in the frigid waters to show their enthusiasm and zeal about the upcoming game. Since the 1960s, Clemson players have rubbed their hands over a rock, named Howard’s Rock, before each game. The rock is named after legendary coach Frank Howard. Part of the tradition is also running down “The Hill”. The players gather around the rock and then run down “The Hill” into the stadium, where more than 80,000 screaming fans await them! Florida State’s famous flaming spear is another crowd-pleaser! At home games a student, dressed as the famous Seminole Chief Osceola, charges down field on a horse named Renegade and thrusts a flaming spear in the middle of the field. Click below to see this spectacular Seminole tradition. UNC is known more for its basketball, rather than football, prowess. The program has been making strides, however, and it won’t be long until the Tar Heels develop some sort of pre-game ritual that eventually becomes tradition. But, UNC’s contribution to football is significant, as they are credited with creating the forward pass! In an 1895 game against the UGA Bulldogs, the Tar Heels punt was about to be blocked, when the punter suddenly lobbed the ball to his teammate who went on to score and win the game! It would be a much different game without passing, so in our opinion, that’s a pretty good tradition to have started! We have saved the BEST for last! Yes, the best ENTRANCE in college football belongs to Virginia Tech! The tradition begins as players assemble in a tunnel and jump up to touch the Hokie Stone as they enter Lane Stadium. As Metallica’s “Enter Sandman” blasts throughout the stadium, over 70,000 screaming Hokies jump up and down, creating a wild, frenzied venue. Unless you have experienced the thrill and goose bumps firsthand, words alone do not do this amazing tradition justice. To see what it’s all about, click below. Tonight’s ESPN prime time college football game features the battle of the techies, as Virginia Tech hosts ACC defending champs Georgia Tech (5-3) at Lane Stadium. VT started the season with high expectations. The phrase “national championship” was even bantered about by sports analysts during the summer, as it was widely believed the Hokies had one of the most talented offensive rosters in their history. After a loss to Boise State and a stunning defeat by James Madison, the Hokies have won their last 6 games. Now Virginia Tech sits at 22 in the BCS rankings and is slowly trying to climb its way to a major bowl appearance. So, what does tonight’s match up look like? The Hokies are undefeated in conference play and are the team to beat in the ACC. They have lost to Georgia Tech 2 consecutive years, but this Hokies squad should be able to break that streak. The Hokies offense seems to be clicking, with a powerful, healthy backfield and QB Tyrod Taylor taking charge of the offense. The dual-threat Taylor has thrown for over 1600 yards this season and rushed for over 500. With just 95 more total yards, he will become VT’s all time leader for total offense. Defensively, the Hokies are a young unit. But Georgia Tech’s offense is pretty one dimensional, with 21 of their 28 TDs this season coming off run plays. VT Defensive Coordinator, Bud Foster, is a strategy guru and will likely load the box, forcing struggling Georgia Tech QB Josh Nesbitt to throw. It has been a rainy day in Blacksburg and the temperature at kickoff (7:30 pm) is expected to be around 45 degrees. Despite the conditions, Hokie fans are out in force today, ready to support their team. Campus parking lots have been swarming with tailgaters all day. Classes? It seems many students have decided to forgo class and tailgate vigorously as they prepare for this rivalry game! Tonight’s bone-chilling weather calls for a hot tailgate beverage! One of our fall favorites is our version of spiked hot apple cider. 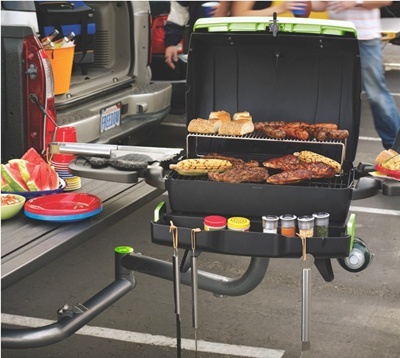 Pair it with some great grilled burgers and hot dogs for a terrific tailgating treat. So mix up a nice, big batch of our hot spiked cider and sit back and enjoy the battle of the two Techs! 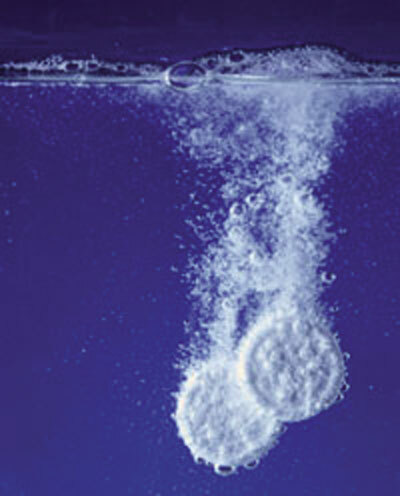 In a large saucepan, bring water to a boil. Remove from heat, adding the orange spice tea bags. Cover pan and steep approx. 5 minutes. Remove tea bags. Next, stir in brown sugar, apple cider, rum, and 4 cinnamon sticks. Heat just to warm, do not boil. Pour hot spiked cider into large thermal carafes to keep warm until game time. Ladle cider into insulated mugs, garnishing each with a cinnamon “swizzle” stick and enjoy!